Cabinetry: Crestwood Cabinets, Traditional series (inset), Wakefield door style, Maple wood, with a finish of SPC0219 paint. 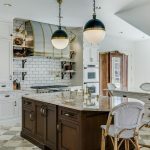 Appliances: Subzero ice maker, Thermador 36” built-in French door fridge with custom cabinet panels, Subzero fridge drawers, Dacor dual fuel range, microwave drawer and warming drawer. Fisher & Paykel double dishwasher drawers. Marvel wine and beverage coolers. 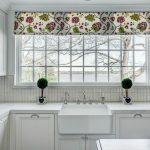 Hardware & Fixtures: Herbeau 30″ Luberon Fireclay Farm House kitchen sink, Blanco Wave island sink, Rohl Perrin & Rowe main and island faucet. Rohl country swing pot filler.